IBM Workplace Web Content Management is a powerful and sophisticated Web content management product that is designed to accelerate development and delivery of critical business information. It enables end-to-end collaboration for content creation, approvals, management, retention, and publishing across Internet, intranet, extranet, and portal assets. Despite its power, it is remarkably easy to use. 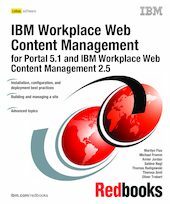 This IBM Redbooks publication provides a comprehensive approach to understanding and using IBM Workplace Web Content Management. It addresses the specific technical aspects of IBM Workplace Web Content Management and discusses its underlying architecture and features. It also recommends deployment scenarios and provides detailed discussions on how to best use the product to take advantage of built-in features and its extensible API. To address the needs of a broad range of users, this book provides a basic tutorial and then builds upon this foundation to explore advanced topics and opportunities for customization. This book discusses key concepts and best practices for creating a accurate Information Architecture and site framework. It also addresses how to upgrade data from earlier versions of the product and how to migrate data from external Web content management systems.